"I'll get to it this summer." "That's a great summer project." "We have the whole summer to do that!" Please tell me I'm not the only person who says these things. Every year the myth of summer vacation calls to me, convincing me that two short months are long enough to accomplish all the leftovers from the ten months before...not to mention taking trips, cleaning my house from top to bottom, and getting everything ready for another year of home schooling in August. As I sit here looking at my sewing to-do list, my house & school to-do list, and my calendar for the month of July, I can't make the numbers work unless I cut back to about five hours of sleep each night, an idea which -- trust me -- is not going to be good for anybody in this house. A few things have to go by the wayside, and I've decided that since there are so few of us sewing along, one of those things will have to be the Graph Paper Quilt Along. I hope you all will understand. I couldn't bring the sew along to a close without showing you Small Project #3, the incredibly talented Chase's amazing Mini I-Pad Pouch. While I don't have any such electronic devices in my life, I wasn't about to let that stop me. I love this little pouch to pieces. If you want to make one of your own, you'll find all the instructions right here. My pouch is lined in a cheerful retro style fabric by Denyse Schmidt, and I used a musical print by Tim Holtz from his latest round of Eclectic Elements for the outer flap. I quilted the piece with a lovely peach colored thread by Aurifil. For me, the hardest part was deciding which patchwork panel to relegate to the back of the pouch. Can't we just have two fronts? So as I near the halfway point of our summer vacation, I'm officially waving the white flag of surrender. I'm willing to admit it: I can't do everything. I figure I might as well make peace with it now, reset my expectations, and stay off the hamster wheel. After all, what am I going to remember a year from now...crossing every item off my to-do lists or taking time to actually enjoy my life? Something tells me the second option is the way to go. This week I made something that's been on my to-do list for at least two years: a desktop ironing board. I can't begin to tell you how much I love it. If you've been thinking about making one yourself, don't hesitate any longer. You'll absolutely love this handy little tool. There are several tutorials out there, but this is the one that I followed. I covered mine with one of my favorite prints by Melody Miller. It just makes the whole room a happier place. I've reached the "sewing room floor = design board" stage of the quilting process. The picture above shows where I was last night (forgive the bad lighting -- it's so hard to get a good photo of this sort of thing). After a lot of debating, I finally decided to alternate colorful and low volume squares for my quilt. It's a simple look that I love. During my local quilt group's first Sit and Sew on Saturday, I sewed random pairs of squares together and then had fun spreading them out on the floor over the weekend. I'm hoping to have a quilt top ready to go in a day or two. If you've finished your quilt top and are searching for some fun quilt backing inspiration, look no further than Pinterest. There are about a million and one amazing ideas to be found there. That being said, there's nothing wrong with pulling out a print or two and making a simple backing for your quilt. As always, make it the way you want it! Link-up time! Share your own quilt progress. Show us pictures of your pincushion or patchwork wristlet. 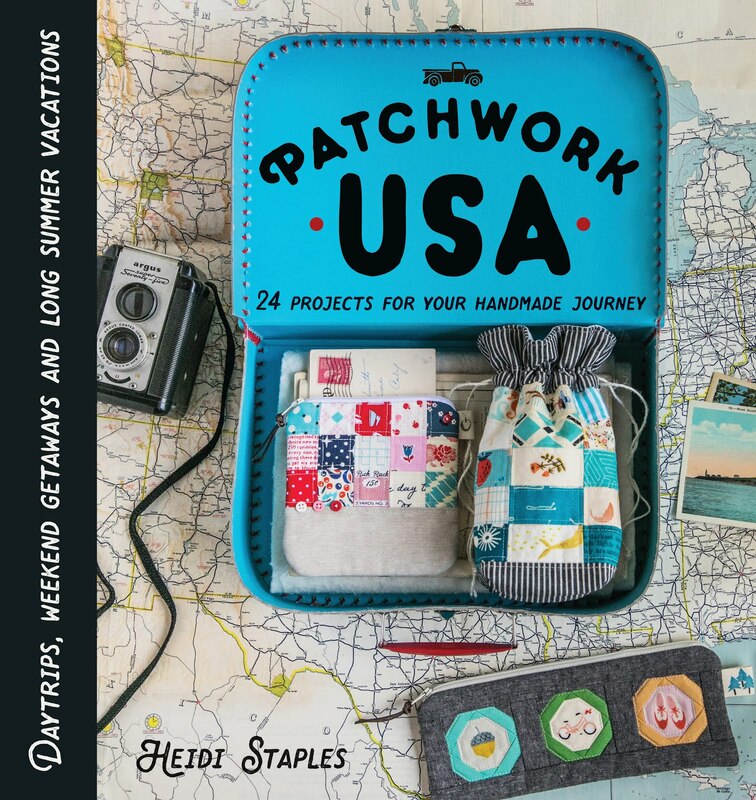 Tell us about another project you're making with patchwork squares. We can't wait to see it! My mom embroidered this picture for my grandparents back in 1980 for their anniversary. I love it so much. I've shared several posts here at Fabric Mutt about my grandmother who passed away a few months ago. While I loved her very much, there was, sadly, a dark side to it all. Despite our many attempts over the years to change the situation, my grandmother was a hoarder. Who can say what really started it -- her childhood during the Depression, her obsession with antiques, her refusal to throw anything away. Whatever the cause, by the time we moved her into an assisted living apartment and were faced with the task of cleaning out her house, it was an absolute disaster. The front bedroom in my grandmother's house -- after my sister had cleared a path down the center. My brother-in-law, sister, me, and my husband on that glorious last day of work. 1. Get help. Don't even think about tackling something like this by yourself. Find friends and family members you can trust who are willing to help you go through items. 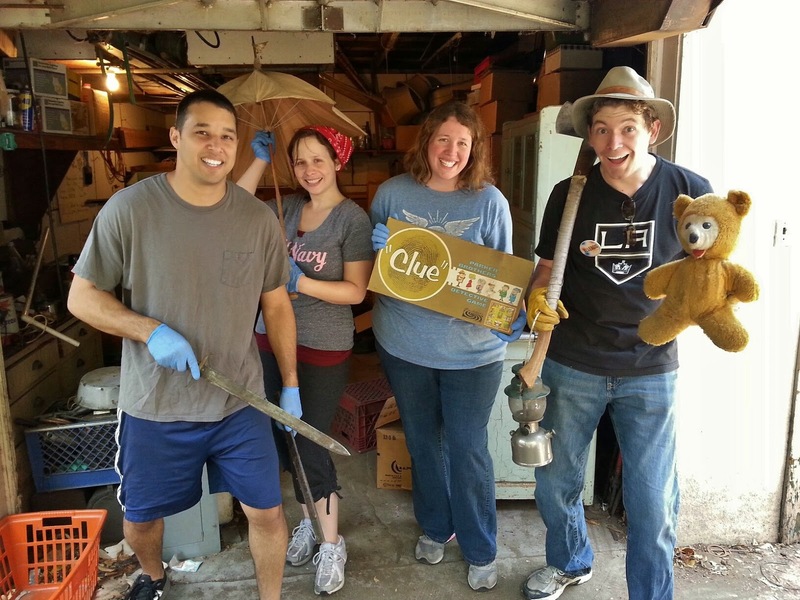 Do some research and choose a nearby estate sale group to assist you like the one we found. Realize that this is not a job that you can finish in a weekend; it takes time, patience, and much coordinating of schedules to get it done. Also be aware of your own limits. My mother knew that she would struggle emotionally with going through some of the items at the house. We worked out a system where other family members tackled those things so that she didn't have to. Those blue rubber gloves were my best friends, even when holding treasures like these. 2. Use caution. 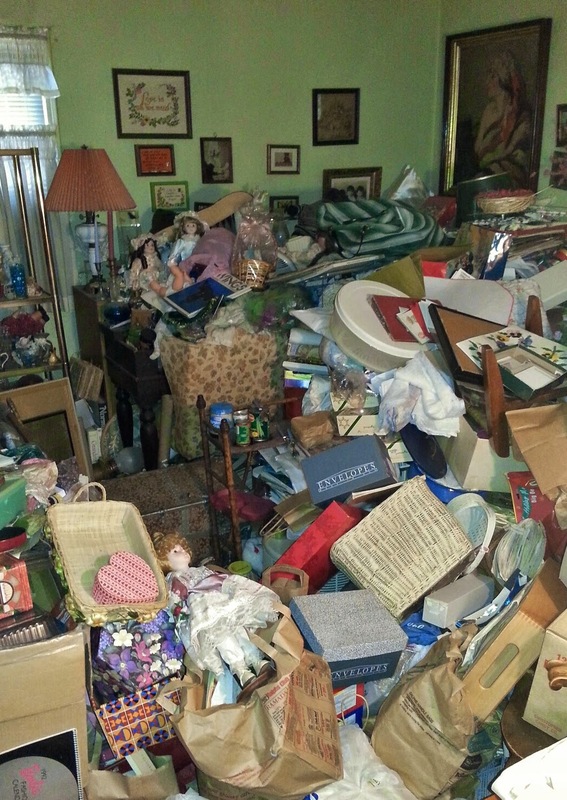 A hoarder's house can be a very dangerous place, and you have to arm yourself accordingly to clean it out. We rented several dumpsters and had them emptied as often as necessary to deal with the mounds of garbage that needed to be removed from the property. All of us wore rubber gloves to protect our hands while we worked. When the dust levels got bad, we put on masks to spare our lungs -- especially important for my sister and husband who both have asthma. Be sure that everyone is up on their tetanus shots. My sister was stabbed by an old needle, and I had a run-in with a rusty circular saw blade. Keep first aid supplies close at hand in case you need them. Anything looks gorgeous in jadite bowls, vaseline glass containers, and vintage measuring cups. 3. Be picky. Have a goal in mind when you go through the house. Our plan was to remove important or meaningful family mementos (photos, letters, pieces of my mom's needlework, etc. ), legal or financial documents, and money (my grandmother loved to hide it in odd places all around her house). Everything else was left for the estate people to go through. As we worked, we set aside any special items that we wanted to keep. I made a rule for myself that I wouldn't save anything unless I had a pretty good idea of where it was going when it came home with me. Most of the objects I kept will be living in my sewing room: original Ball jars, jadite and milk glass, a typewriter, silk maps that my grandfather carried with him during WWII, a few old wooden soda crates, and so on. I'll use most of them to hold sewing notions or decorate the walls. My new fabric cabinet which once belonged to my great grandfather. It's topped with an old typewriter we found in the studio apartment behind the house. These are by far my two favorite items that I brought home with me. 4. Learn from the past. Anyone who's spent time cleaning the house of a hoarder will have a hard time wanting to ever bring anything into their house again that isn't a consumable item. All of us feel that this experience has taught us to make some better choices in our own homes about what we keep and discard. Now that we've finished going through my grandmother's house, my mom and I have been spending time purging our own home of items that can be thrown away or donated. Hoarding is a sickness, but it doesn't have to be contagious if we're willing to put a stop to it. For the last decade of her life, my grandmother never left her house more than a handful of times. She couldn't leave her treasures unprotected, she said, and it broke our hearts to watch her become a prisoner within the walls of her own home. It could have all been so different. She could have been out spending time with her family, playing with her great grandchildren, and making some wonderful memories during her last years here on earth. Instead, she spent her days guarding dusty mounds of glass, paper, metal, and wood. I have drawn my own line in the sand. It ends here. And may I add that this includes fabric hoarding. It's time to break it all out of the cabinet and start using it. What am I saving it for? Why not enjoy it while I can? I need to stop stashing and start sewing. I'm reminded of an old quote by Jonathan Swift who said, "May you live all the days of your life." How I pray that we do. This week's small project for the Graph Paper Quilt Along is by the Queen of Patchwork herself, my sweet friend Ayumi. If you're looking for a great last minute gift, her Patchwork Wristlet is a wonderful choice. I always love how clear and detailed Ayumi's tutorials are, and this is no exception. To those of you who struggle with zipper phobia as I once did, here's a great project for getting your feet wet. You'll find all the instructions for making her adorable wristlet right here. I tried to use a lot of text and low volume prints for this project. It's always so much fun to search for exactly the right piece of fabric to fussy cut. I love the light and airy feel of this little pouch, but I think it would also look amazing done up in a range of solid fabrics. This is why I love sewing. There are always so many creative possibilities! Remember that I'll have another blog link-up next Monday for you to share your finished wristlets as well as progress on your quilts. I can't tell you how much I've enjoyed working on the small projects for this quilt along (yes, I admit, I've already finished project #3, and I absolutely adore it!). Pulling together my favorite fabrics, the rhythm of nesting the seams together and chain piecing my squares -- it's all been a quiet sort of therapy for me during what's otherwise been a pretty demanding month. But I'll share more about that in my next post. Until then, happy sewing! When I saw the first pictures of April Rhodes' Arizona collection, I was absolutely enthralled. Her prints are so well developed and executed. The dreamy color scheme and the uniquely modern take on southwestern design motifs are perfection. Our family's annual trips to southern Arizona over the past few years to visit my in-laws have earned the state a special place in my heart. Green Valley is just thirty minutes south of Tuscon, and to me it is always a study in contrasts. Yes, there's mind numbing heat, but there are also lush groves of pecan trees, soft brown bunnies playing among the cacti, and spectacular thunderstorms every July evening. April's collection captures the untamed spirit of Arizona in such a fresh way. I've been wanting to write a new clutch tutorial for a while, and this fabric was exactly what I needed to do it. 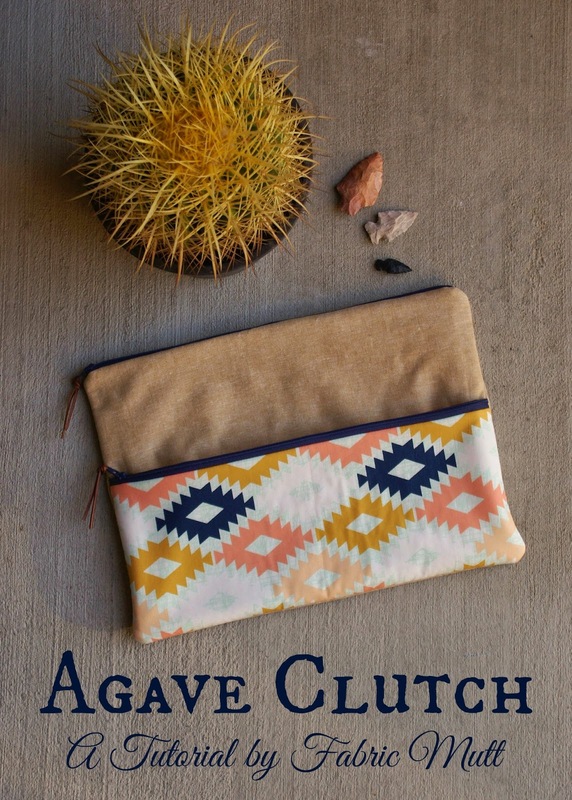 I'm thrilled to present you today with a tutorial for the Agave Clutch. Those of you who are familiar with my work know that I love simplicity when it comes to design. This clutch is nothing more than a zipper pouch with a smaller zipper pouch attached to the front. Batting gives it a comfortable stability, and linen is an almost rustic backdrop to the colorful prints. One of my constant complaints with clutch purses is that they are too small. I'm so used to carrying my enormous purse with me everywhere I go, and downsizing to a clutch is usually beyond my abilities. I designed this one to have a clean style yet plenty of room. I can easily fit my wallet, sunglasses, keys, and phone inside this bag without worrying that it's going to burst at the seams. To top it all off, this is a fairly quick project. You can easily make one during an afternoon of sewing. *I prefer to use regular quilt batting which I attach with adhesive basting spray, but you can also use fusible batting. Do what works for you! 1. Attach the Batting: Fuse the 10 x 14" pieces of batting to the linen rectangles and the 6 x 14" pieces of batting to the wrong side of the 6 x 14" pieces for the front zipper pocket exterior. 2. Make the Front Zipper Pocket: Stack in this order from bottom to top along a long side: front zipper pocket exterior piece (right side up), zipper (right side down), and front zipper pocket lining piece (right side down). Sew 1/4" from the long edge, and then press the fabric back from the zipper on each side. Repeat on the other side with the other front zipper pocket exterior piece and lining piece. 3. Attach the Front Zipper Pocket: Fold the two front zipper pocket exterior and lining pieces down so that the lining pieces are touching each other, and the exterior pieces come down on each side of the zipper. Unzip the zipper slightly so that it's out of the way of your sewing. Place the front zipper pocket on top of the lower half of one of the linen clutch exterior pieces, and use binding clips to hold it in place. Set your sewing machine to its longest straight stitch and baste the front zipper pocket to the linen clutch exterior piece about 1/4" from the edge. 4. Insert the Main Zipper: Stack in this order from bottom to top along a long side: front linen clutch exterior piece with front pocket -- be sure that you attach the zipper to the side opposite the pocket! -- (right side up), zipper (right side down), and clutch lining piece (right side down). Sew 1/4" from the long edge, and then press the fabric back from the zipper on each side. Repeat on the other side with the other linen clutch exterior piece and clutch lining piece. Be sure to unzip the main zipper at least halfway. 5. Sew the Main Body of the Clutch: Fold the exterior clutch pieces back from the main zipper so that their right sides are touching and clip them together with binding clips, being sure that the zipper teeth are pointed toward the bag exterior. Fold the clutch lining pieces back from the zipper so that their right sides are touching, and clip them in place as well. Following the diagram above, sew 1/2" from the edge all the way around the outside of the lining and exterior pieces, backstitching at least once over the main zipper as you go and leaving a large gap in the bottom of the lining. 6. Finish the Clutch: Trim your seam allowance down to about 1/4" and clip the corners. Reach in the through the gap in the lining and pull the exterior of the clutch out through the hole. Use a chopstick to push out the corners of the clutch and give it a good pressing with your iron. Tuck the raw edges of the lining gap inside, press, and stitch it closed by sewing about 1/8" from the bottom edge of the lining. Push the lining into the bag and press it one more time. If you like, thread thin strips of leather through the zipper pull and knot them for a both practical and decorative touch. Use and enjoy! If you make one of these please share it on Instagram with the hashtag #agaveclutch and be sure to tag me @fabricmutt. I hope you'll enjoy using this clutch as much as I do. I can't wait to take it along on our upcoming summer trips! 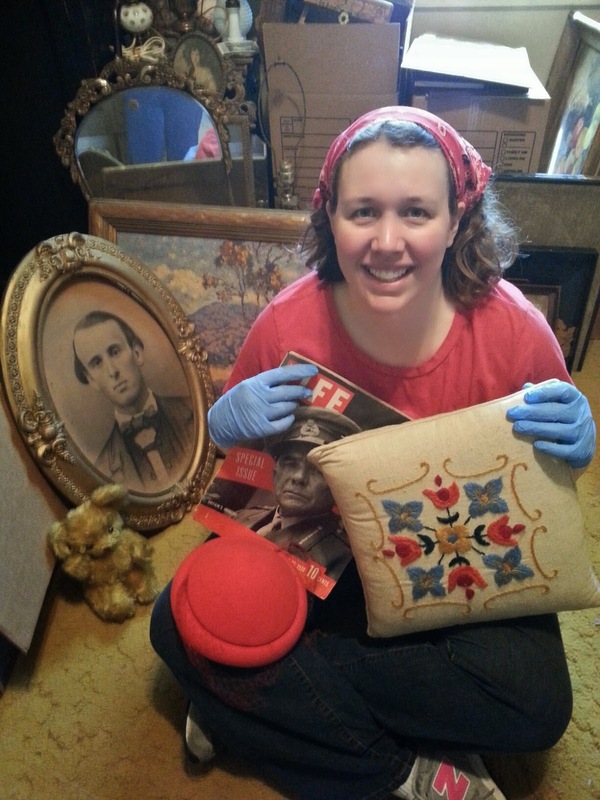 As those of you who follow me on Instagram know, I've been cleaning out my grandmother's old house in preparation for next month's estate sale, so I've been spending more time lately wading through dusty antiques than cutting out fabric squares. I'm definitely going to have to put in some time at the cutting table this week if I'm going to stay on top of things. For my queen size quilt, I've decided to use seven inch squares in a range of different colors. The stack above is as far as I've gotten. At this point, it's almost all prints by Anna Maria Horner, but it should be a much more diverse mix by the end of the week. I can't wait to start laying these out in a design. If you've never pieced simple squares before, there are definitely some things to keep in mind if you want everything to line up just right on your quilt top. You can read all about nesting seams at Sew Can She and Sew Mama Sew. Trust me...this information is worth its weight in gold. If you're new to the quilt along, you can get all the details by clicking on the Sew Along tab above. I hope you'll join us! Our first small project for the Graph Paper Quilt Along is an absolutely adorable pincushion by my talented friend Svetlana of S.O.T.A.K. Handmade. This little beauty uses 1 1/2" squares and a brilliant piecing method first devised by Elizabeth Hartman of Oh, Fransson! I used scraps from the original Far, Far Away collection by Heather Ross for my version, and I'm completely in love with the results. You'll find the full tutorial complete with photos and all directions here. 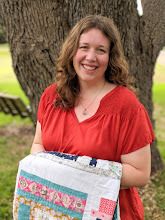 This project is perfect for fussy cutting your tiniest pieces of treasured fabric.The only square that I quilted on mine is the one with the little princess shoes which I framed in gold Aurifil thread. I also added a piece of ruler twill tape for the loop on the side and backed it in more of this velvety soft cotton gauze. Every time I look at this pincushion, I want to hug it. That's normal, right? Be sure to check out Svetlana's tutorials page for more great patchwork projects. She has a bright, colorful style that I just adore! Next Monday I'll have a blog link up here so that you can share your versions of the pincushion as well as progress on your quilts. If you're on Instagram, you can also tag your pictures with #graphpaperqal. I can't wait to see what you're making!